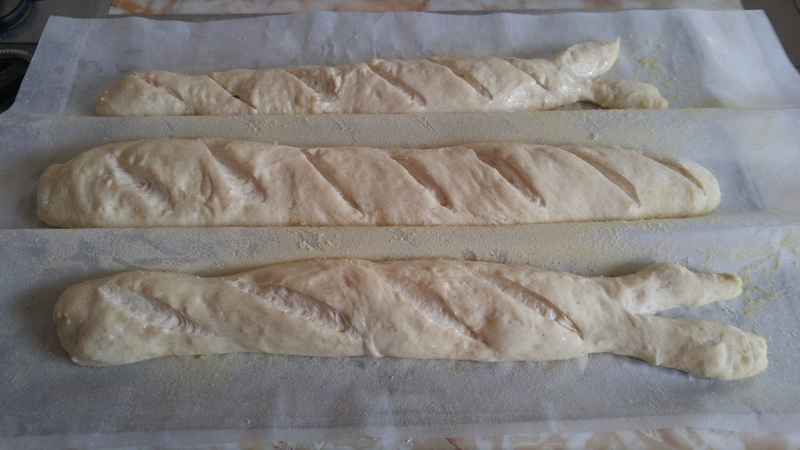 I do not think it is possible to make a Paris style baguette in the home. To me, a good baguette is almost like an incendiary device. A crust so crisp that it shatters and explodes when a piece is broken off. So much so that the broom and dustpan are required to clean up shards of cracked crust and dusty semolina off the table and floor. The colour of the baguette should be a dark burnished gold. 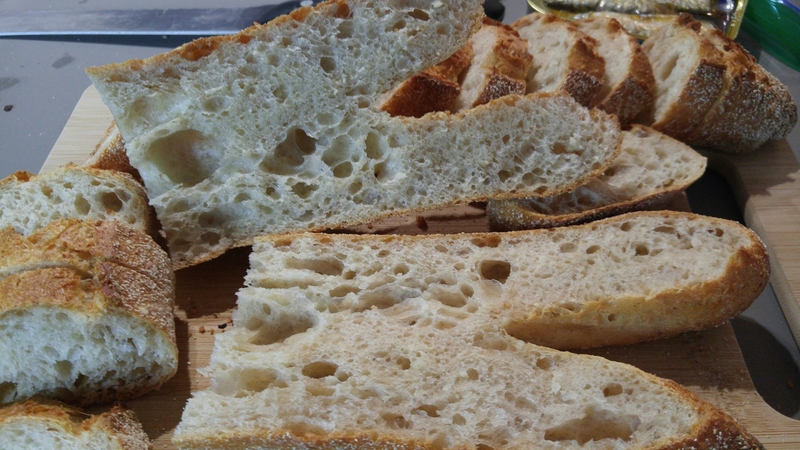 The crumb should have large aerated holes, chewy and almost nutty in fermented flavour. The closest I have come to achieving my vision of what a baguette should be to date is with Rose Levy Berenbaum’s recipe. 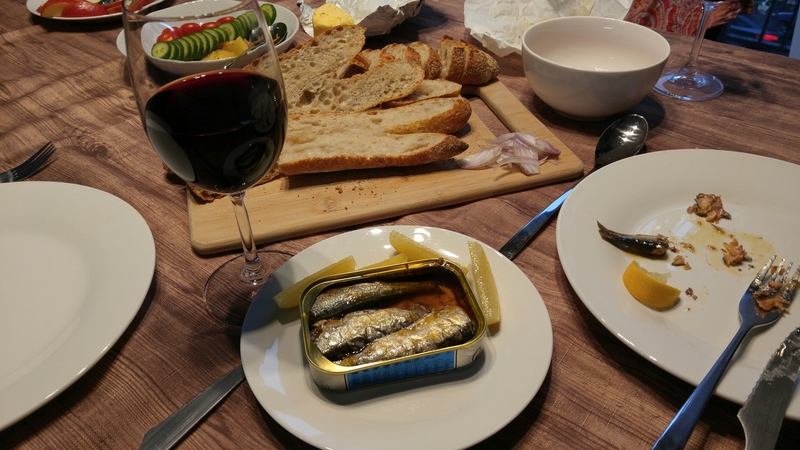 I should probably revise my statement a little…I do not think that I can make a good baguette with the oven and equipment that I currently own. 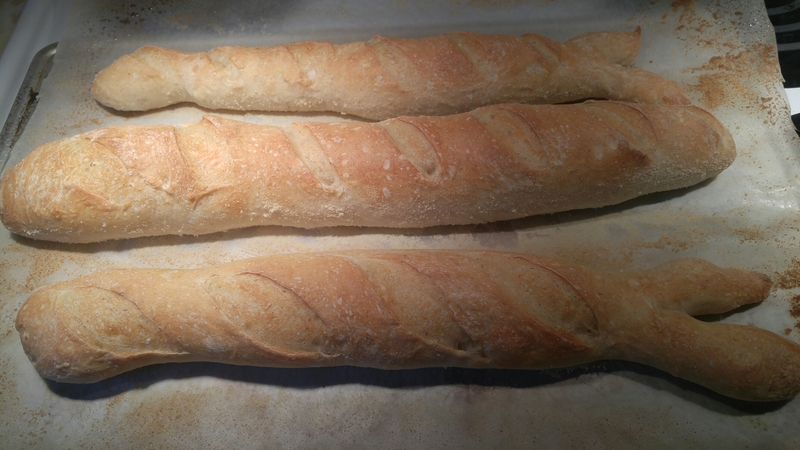 I planned to tackle the Poolish baguette from the BBA for Wednesday, St. Valentines Day. Baguettes are a favourite of my husband so I was highly motivated to ensure the bread was a success. Why, because I love him, dearly. Peter Reinhart suggests that the poolish baguette is his number 2 favourite baguette. 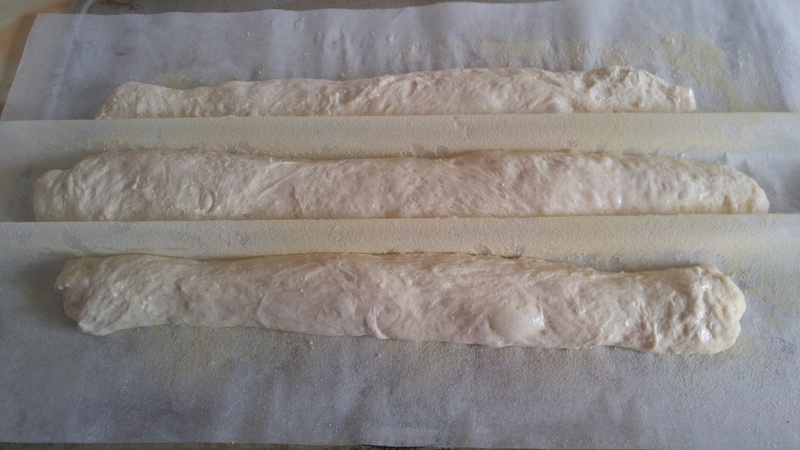 The poolish baguette was a process that was discovered by Bernard Ganachaud in the 1960’s. Mr. Reinhart goes on to state that when M.Ganachaud retired in the 90’s his version la flûte Gana was so popular that it became a licensed commodity. The boulangeurs who wished bake his version had to pay for the right to bake and sell it but were also permitted to charge an additional franc above the government controlled price. 1. This dough takes two days to make. The first day was making and fermenting the poolish. I had no difficulties with the poolish, this is something I have made many, many times before. We usually keep our house temperature in the winter at 69 degrees. 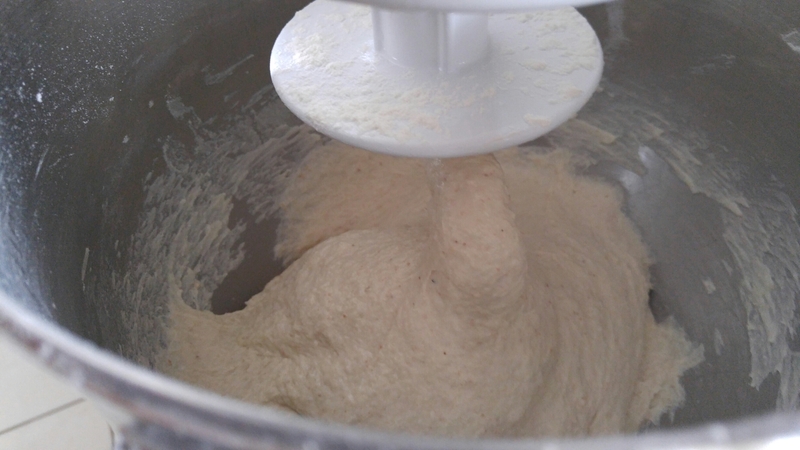 Nana and I agreed that in the interest of my bread, science experiments we should increase the temperature of the house to 71 so that the Poolish actually fermented in the suggested 3-4 hours before putting it in the fridge overnight. The following day the house was toasty at 71 so the chill left the poolish in a little over an hour. I have often wondered if my kitchen scale is accurate so I weighed and then re-weighed all my ingredients before starting the dough to be absolutely certain the only room for difficulties would be oven and equipment baking off the baguettes. My dough was sticky, really sticky instead of just tacky…so much so that I knew that extra flour was required. 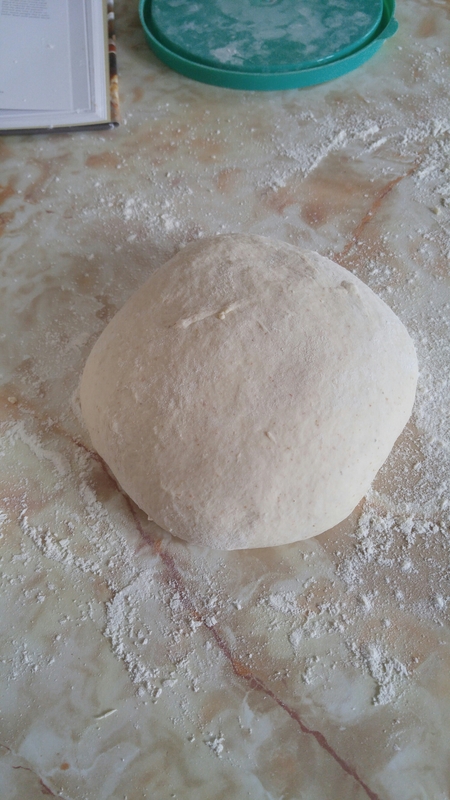 The dough would never have released from the bowl of the stand mixer without the addition of flour before killing the yeast on account of the increased heat from the friction in the bowl. So I veared from the recipe and added flour until I reached the required tacky feeling. In my gut, I knew this was not a good portent. The written instructions stated that an hour of stretch and folds were to be completed in twenty minute intervals before a 2 hour ferment, a degassing of the dough and a second 2 hour ferment. 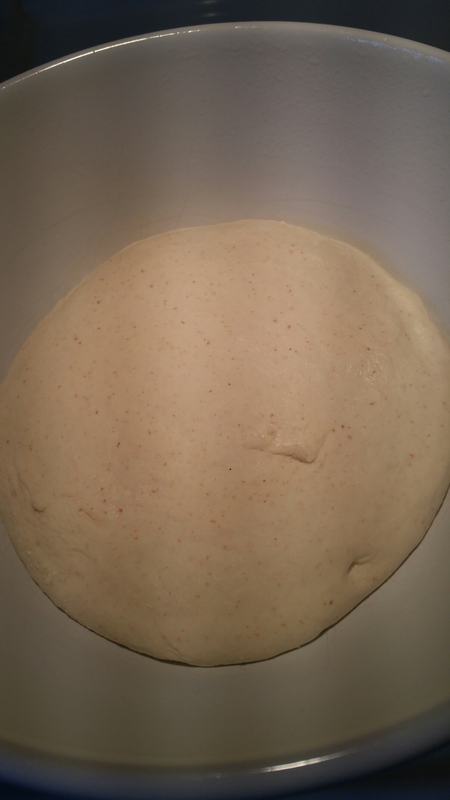 For those who are curious a stretch and fold is flattening the dough into a disk. Imagine the disk as a face of a clock, then stretch a section of the dough from 2:00 out and fold it back on top of the disk of dough. This process is repeated at 4:00, 8:00 and 10:00. My linen couche had not yet arrived so I delicately removed the dough from the bowl after the second ferment, shaped the dough and let it proove on oil misted, semolina crusted piece of parchment paper. Surprisingly it worked and the dough rose instead of spreading. I need work on slashing technique or my lame is not the right kind. Personally, I prefer using a serrated knife to slash the dough. I prepared my oven for hearth baking by preheating it to 500 with my pizza stone. I added a tray in the bottom of the oven and just before putting my baguettes in the oven I added a cup of water for steam. I followed the instructions of misting the walls of the oven every 30 seconds for two minutes. I removed them from the oven when they reached an internal temperature 205. The verdict. I wasn’t happy with the end result. 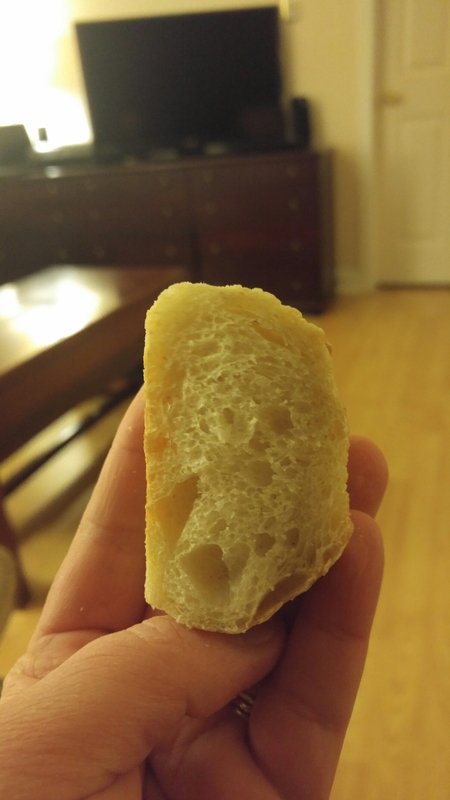 If you look at the picture of the baguette from Paris, you can tell the crust was crisp. Mine was not. Even at 500 degrees, mine did not achieve the colour of the baguette I am used to and long for. The texture was not chewy, nor did it taste fermented. I would not suggest that this is the fault of the recipe, rather I would suggest that my oven has issues and that these really need to be baked in the proper pan and in a wood fired oven. At the end of the day I want to be clear, I am not cranky, because at the end of the day all three baguettes were consumed with abandon. This was my weekly taste of bread and I enjoyed my meal. They were after all home made and that tastes better than any baguette or bread that is purchased because they were made with love. St. Valentines Day 2017 was a pas de deux with two adults, one of which was sick with a head cold and the other who was trying hard to make something for her husband she knew he loved. 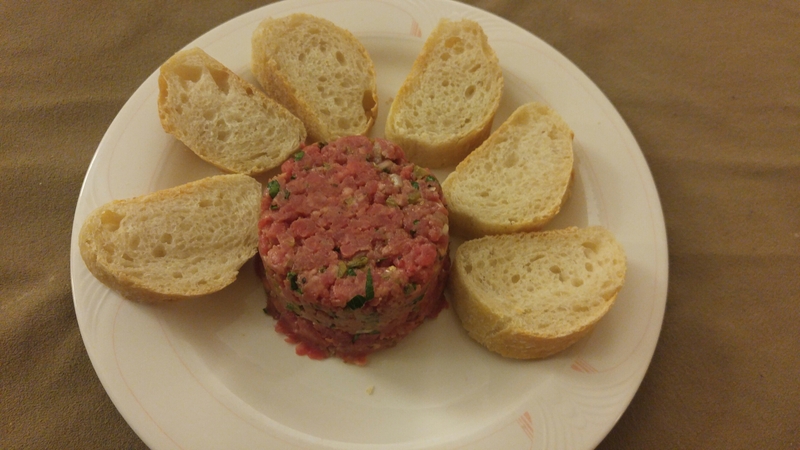 Steak tartar was on the menu and both parties were sound asleep by 19:30 after Matthew was put to bed. 1.Reinhart,Peter. 2016. Bread Bakers Apprentice. New York, USA: Ten Speed Press. 223 p.
← Chuck Jones, Coyotes and and Serpents…Oh my.